A while ago at EFTTEX, I stumbled upon the stand of the guys from American Fishing Wire (AFW). This USA based company is famous for leader material which has found it’s way into many tackleboxes. They are the producers of high quality terminal tackle and serve the needs of modern Esox anglers all around the world! 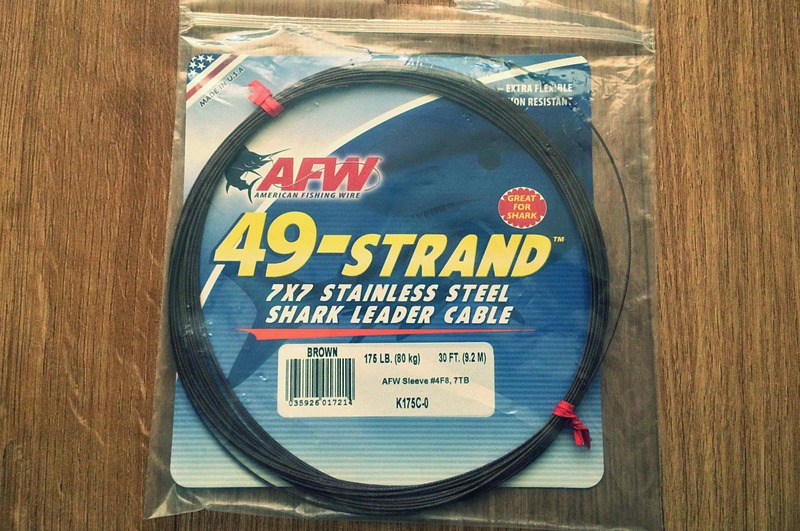 A year ago I found out about AFW 49-strand Shark leader cable. I knew one shop in that sold it, and decided to give them a call. The guy on the other side of the phone seemed very surprised that I wanted to use this leader material for Pike fishing. I decided not to buy it, because the thickness of the cable they sold, was too much. Of all the leader material out there in Europe, there was no 49-strand available, at least, not the Shark leader cable I was looking for. So when visiting the AFW stand the first thing that my eye caught was… You name it! The perfect leader to fish heavy baits such as this Magnum Bulldawg! But why 49-strand? First of all it’s corrosion resistant made from type 304 stainless steel, which means it doesn’t rust and keeps it’s strength no matter what. And second, like the package says: ”shark leader cable provides excellent kink resistance and bite protection against Sharks and other big game toothy fish. Often when a Shark strikes a bait, they twirl violently. This motion can kink single strand leader wire and can actually be more destructive to your tackle than the fierce bite”. 49-strand resists kinking and wrestles back, which is something 7-strand can’t do! This is exactly the main reason why I love it so much. I’ve been using this material for quite some time now, and have landed quite a large number of Pike with it already. The colour of this leader is dark brown so it fits in great with most waters, if you think the colour of the leader makes a difference in your fishing. I certainly do not, but who knows it might even help! Another thing that I find very usefull about this leader is the flexibility. In some way it’s actually more flexable then 7 strand or titanium wire, which is great. And it’s super, super strong. And that’s really important when fishing for any Esox, and in my case the Pike. Your material needs to be the best of the best. Using lightweight leaders, fluorocarbon or hard mono in the worst case, doesn’t make sense at all. 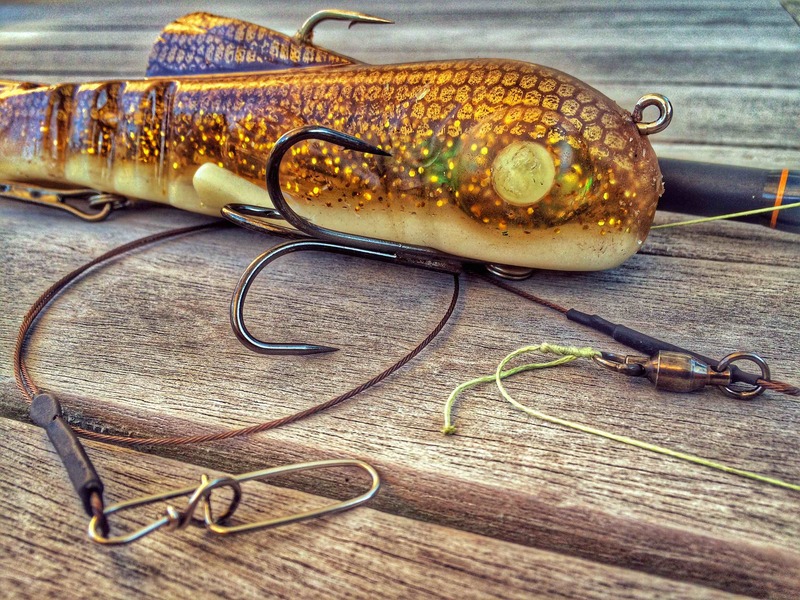 Remember you are targeting some of the largest fish that swim in freshwater. So don’t make room for any compromises! Fluorocarbon is abrasion resistant, NOT toothproof, the same goes for hardmono. And using a leader that is too light will break when you least expect it. I can’t say it enough, go for the best of the best… Later on this year, a step by step guide will be added on how to make yourself the ultimate leader out of this material, so keep a close eye on the site! 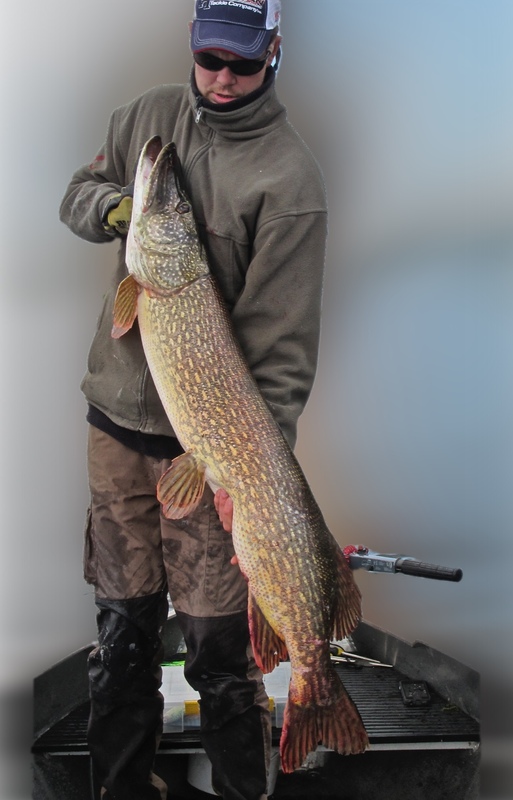 Visible or not, this 51,57” (131cm) Pike, had no problems with the 49-strand leader!